While I was putting this look together I wasn’t quite sure where I wanted to go visually to present it on the pages of this blog; then I remembered I had the “Pills” pose from Reve Obscura. Looking at how I was dressed I looked like an athlete of some sort and I thought maybe if I find a cool gym to shoot at then I could kind of use the angle of someone who needs to use pills to keep themselves going or to keep their edge in whatever profession they are in. That is where the soundtrack for this blog post comes in. Listening to it and really honing into the lyrics you can easily tell it is about the drug culture (more specifically in America but could easily apply to anywhere). It made a lot of sense to use it with the setting that my persona of an athlete taking medications (and most likely abusing them). The Arcade opened up for it’s first event of 2018 and there were a lot of great products and machines and a mixture of different types of things, but there were only a small handful of things that caught my eye. I found myself trying to pick up certain figures in the Garbaggio SuperStars Vol. 2 collection (as well as help my buddy Kash out since I seem to have luck with them). The Gabriel machine has a really cool outfit which I didn’t have to play because my brother Ethan was nice enough to win me the important things (Thanks bubs!). My favorite machine that is at the Arcade is the Versov “Beanie Gacha” which is pretty much filled with parts of an outfit for people who like skater wear (beanies, glasses…etc) but the one thing that put me over the top was the RARE sneakers which I am saving for an upcoming blog because I love the shoes I am wearing in this look). I am wearing a plain beanie from the Gacha but there is a RARE version that has color change and I like that kind of customization; it’s very high on my list when it comes to clothing and accessories. The beanie has a resizer installed in it and I only had to do a minor bit of adjusting but it nearly fit perfect right out of the gates. Kustom9 is where you can find these super awesome sneakers from VALE KOER, named the “Squid Attack Trainers” and I love the brands customization so much that I went with the FATPACK. I did my best to recreate one of the styles of shoe they had for sale individually because it reminded me a lot of the White Ranger and his Tigerzord from Mighty Morphin Power Rangers (yes there is a pop culture nugget for you!) It also happens to be some of the colors of my favorite NFL team, the New Orleans Saints. Another funny little nugget of a personal nature is that these remind me quite a bit of my bowling shoes (that are patterned after Michael Jordan) that are red and black. I could easily create an in-world version of those and I think I might in a future blog entry. The shorts are currently being featured at the latest round of Hipster Men’s Event and come in 5 different colors (sold individually or all together in a FATPACK). The colors you get are (Caramel, Charcoal, Coffee, Goya and Smoke). I chose these for the fact that most shorts I own in reality are this length and I just have a small hang-up about shorts that are too short. Millo Copperfield has been appearing at more and more events recently and I saw somewhere on social media that there will be a store in-world soon as well which is great to see from a brand that is gaining momentum. Before I forget, the shorts come in sizes for Belleza and Signature (Gianni). 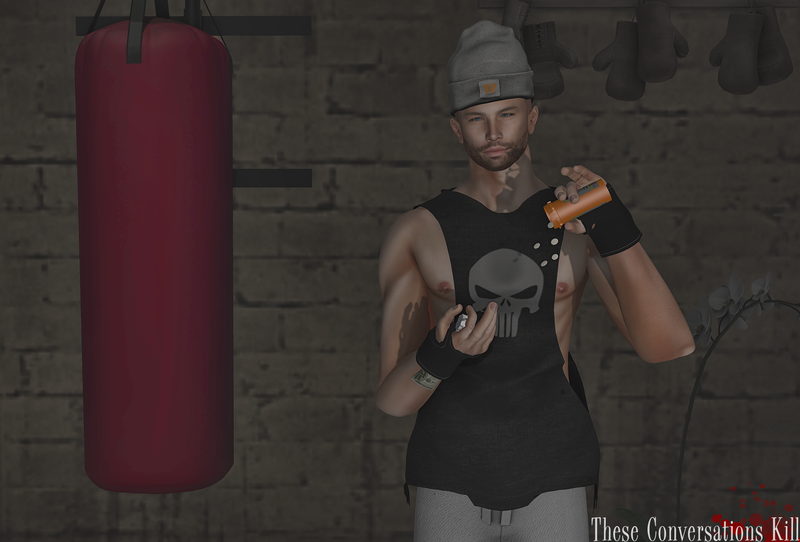 For my last pic I wanted to give you a more up close look of the Versov beanie to see more of it’s excellent texturing as well as more of the action of the “Pills” pose from Reve Obscura that I mentioned at the beginning of the entry. The package for the pose comes with the static bento pose and also the mesh pill bottle/pills as well as the cap. They even included transferable versions so if you would be posing someone that they would be able to use the props as well which I think is fantastic and should be something pose creators that use props like this do more of. It certainly couldn’t hurt and help photographers and bloggers who have friends or models that are not themselves posing for them. Now it is about time to wrap it up for another blog post but check back soon for more great fashion creations from some of my favorite brands as well as new ones that I’m discovering from various events. I’ll be covering Skin Fair 2018 very soon as well as items from FaMESHed, The Men’s Department and more from the Arcade.